NEX LVL Design Pvt. Ltd.
We put the customer needs first at all times with absolute relationship with site surroundings, value of money with timely deliverance (DESIGN TO DELIVER). We believe in innovation with experience and intensive personal attachment. 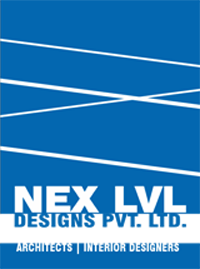 'NEX LVL' – It is a multifaceted firm rendering architectural, interior designing & turnkey solutions to a varied clientele all over India. It is the endeavor of the firm to create a functionally efficient and aesthetically pleasing habitable space through a detailed study and analysis of project / client requirement and priorities. It is our belief that this should be done keeping in mind flexibility of design over a determined time and keeping all factors of design in context with eventual image to be projected. We have a young and talented work force, sensitive & dedicated to the firm’s mission. The firm has been involved in the design and execution of commercial projects such as offices, hotels, shops, boutiques, labs and residential projects as Townships, apartments & bungalows.